Major encroachment of the waste was first apparent in 1432 - 1433 when Humphrey, Duke of Gloucester (brother of King Henry V) obtained Crown consent to enclose about 200 acres from the north section of the Heath towards the Thames at Greenwich. He had been the owner of the Royal Manor of Greenwich from 1426 and his encroachment was to provide a private park and space for a fortified watchtower needed for personal security in dangerous times. His moiety is still marked clearly by the boundary of what is now known as Greenwich Park � a Royal Park and in Crown ownership since Humphrey�s downfall and death in 1447. It is probable that Blackheath, covered with gorse, scrub, pits and hollows, stretched down Blackheath Hill to the west into Deptford, east to the junction of the Old Dover Road with Shooters Hill Road, and north towards the Thames between Greenwich and Charlton. It is likely to have been about 500 acres at the time of Humphrey�s encroachment. But the growth of populations and the need for land for agriculture, horticulture and industrial uses (sand and gravel for building materials and ballast) ate into the gorse-covered acres of the open ground. Nevertheless, the flat tableland was a natural parade ground and rallying point for supporters and rebels alike. 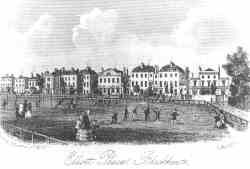 Over the period covering the 12th to the 19th centuries there were countless reports of activity on Blackheath, some of it bloody, some ceremonial, always substantial and frequently on a grand scale.